The Solent Way path is covers 60 miles of the Hampshire Coastline from Milford on Sea, where it connects with the Bournemouth Coast Path, through to the Sussex border at Emsworth Harbour. It takes you through busy sea fronts, yachting harbours, deserted marshland and saltings. There are castles and forts to explore, ships, submarines and museums to visit along the way and you get to see marshes and lagoons at the south end with fauna such as foxtail stonewart, sea anemones and lagoon shrimps. It is well signposted with a Tern on a green arrow. Ordnance Survey maps covering this walk include: Explore IL22 and Landranger 119 and 120. 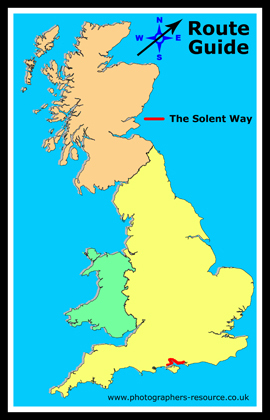 The Solent Way website contains details of the walk together with a breakdown of 8 smaller walks that can be achieved more easily They also have a PDF document which contains a leaflet on the walk. Which as well as giving you some historical background to the area that is covered by the path also gives details of some of the things you may get to see. This section starts in the seaside town of Milford on Sea and follows the shoreline to Hurst Castle Spit at the end of which is Hurst Castle. Getting there: From the A337 between Lymington and Christchurch take the B3058 to Milford on Sea. One of Henry VIII's artillery forts built at the end of a long shingle spit at the went end of the solent to guard the approaches to the Navel Dockyard at Portsmouth. Charles I was imprisoned there in 1648 before being taken to London for his trial and execution. During WWII it was manned with coastal gun batteries and searchlights. It is now owned by English Heritage. Getting there: Only access is via foot which is a 1.5 mile walk from Milford on Sea. Along this stretch you will cross the Lymington River and head inland slightly into the New Forest to Sowley Pond, then along the lanes to Bucklers Hard village where you will see the remains of an 18th century village and a Maritime Museum telling the story of ship building at Bucklers. Getting there: From the A35 at Lyndhurst take the A337 through the New Forest National Park to Lymington. Notes: A market town situated on the southern edge of the New Forest. You can also catch the ferry to Yarmouth on the Isle of Wight from here. The home of Beaulieu Abbey, Palace House and the National Motor Museum. On the way out of the village the path climbs onto Beaulieu Heath a moorland area where you might get to see nightjar, snipe or redshank birds. Or you could of course stop off at Exbury Gardens, a 200 acre woodland garden and steam railway. Getting there: From M3 J2 take the A326 to Beaulieu and follow the signs for National Motor Museum. At Hythe Pier catch the Ferry across to Southampton's Town Quay and make your way through woodland and past Netley Castle and the ruins of Netley Abbey before continuing onto Hamble, you could take a detour and take a visit to Bursledon Windmill. Getting there: M27 J2 take the A326 to Hythe at The Old Manor roundabout take the road into Hythe town centre and follow the tourist signs to the pier and ferry. Notes: Hythe Pier was built in the late 1800's and is 700 yards long and 16 feet wide. It transports both pedestrians, has a cycle way, and runs a narrow gauge railway along it. Each train that runs along it connects with an arrival and departure of the Hythe Ferry that takes passengers and bikes across to Southampton. Along this stretch of the walk there are two nature reserves, the first is the Hook with Warsash Nature Reserve and the second is the Titchfield Haven National Nature Reserve with reedbeds, saltings and marshes. Getting there: M27 J11 take the A27 to Fareham then the B3334 through Titchfield and onto Stubbington and follow the reserve signs. From Hill Head the next stretch follows a long shingle beach to Lee-on-the-Solent and onto Stokes Bay, you are now entering Naval history territory and can see a fort out to sea as well as a land fort and eventually arriving in Gosport where you could visit the Gosport Discovery Centre or Royal Navy Submarine Museum. Getting there: J11 of M27 take the A32 to Gosport and follow the brown anchor signs, turn into Haslar Road and cross Haslar Bridge take second left into it's own free car park. 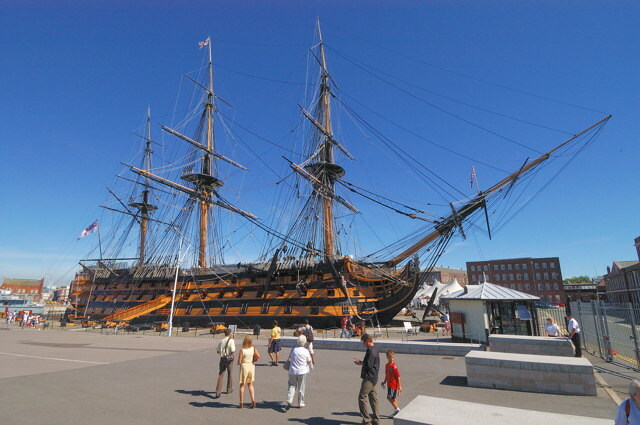 From Gosport take the Ferry across to Portsmouth and pick up the path to follow the coast line, to the west you'll see the Portsmouth Historic Dockyard the home of HMS Victory and the Mary Rose amongst loads more. Past the Spinnakar Tower reaching up to the sky, and then onto the neck of the harbour and along to Southsea before making is way around Langstone Harbour and the Farlington Marshes. Getting there: M27 J12 follow the brown signs to Historic Waterfront. It is easy to find and has it's own FREE car parks. For SATNAV's use PO1 3LA to find it. Notes: Open Daily except 23-26th Dec. Apr-Oct 10am-6pm Nov-Mar 10am-5.30pm. Dogs not allowed except guide dogs. This final small section runs along the shoreline pass the old waterside village of Langstone and its millhouse. Then on past the ruins of Warblington Castle and across the water you can see Hayling Island, then on through the fields and woods to Emsworth and its millponds. Getting there: From the A27 take the A259 into Emsworth village centre. Notes: Emsworth has narrow streets and a busy harbourside and is situated on the edge of Chichester Harbour. There are two tidal mill ponds both with their mills still in tact although now converted into a variety of uses.